At Healing Horses Sanctuary, horses engage with participants for emotional therapy and energy healing. Horses assist individuals in connecting with themselves at a fundamentally deeper level. A horse in its natural state of being is a mirror and teacher for humans. Through interacting with horses in a setting that encourages awareness of body, mind and spirit, healing and learning is achieved for the human. When the body, mind, and spirit are in perfect balance, a person is able to be at one with themselves and pursue a more positive lifestyle. This alignment of the spiritual and physical bodies allows for a truly empowered and joyful individual. People living in energetic balance are able to come from love and feel compassion for others. Energetic work with the horses assists people in living their lives more fully. Consequently, everyone benefits from this. For more on how our horses and energy healing can help you live more fully, see our program details under Healing Humanity. The relationships with the horses at Healing Horses Sanctuary rests on a foundation of enduring love and respect for horses and reverence for the life they represent. This connection originates not from the intellect but from an outpouring of the heart. It is through heart energy that we connect to and heal with the horses. It is this which fosters a deeper sense of connection and spurs us on for an ever deepening understanding of ourselves and our relationship to the horse. 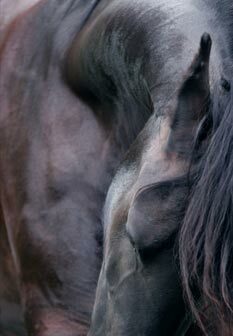 I would suggest putting yourself in the presence of a most magnificent spiritual teacher and healer - a horse.